A lot of information can be understood more easily in the form of a diagram than as a text. i2Brain helps you. Here are 4 videos giving you an in-depth explanation of using i2Brain for your time-management and generally organizing your thoughts. i2Brain is a new type of software for visualizing information and its structure. How can i2Brain help you? sort information visually, thereby helping you and others to understand it better. Here's an innovative way of viewing history. You get away from lists or trees of information. i2Brain shows you what is in your head - a network of information. 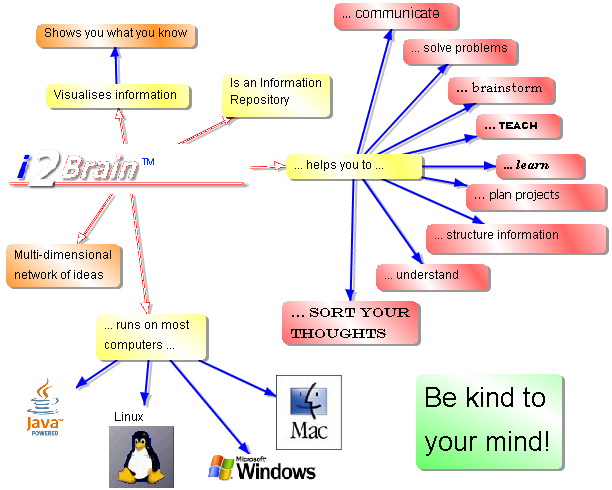 i2Brain isn't just another "MindMapping®" program. It is multi-dimensional. It visualizes your thoughts and plans in depth. Literally. Click here to see a short movie which describes this main argument for i2Brain. When you are planning a project, each activity has a priority. "Priority" is therefore a "dimension". An activity has a "status" (working, finished, tested etc.). So "Status" is also a dimension. And so on. You can define up to 15 dimensions. i2Brain was written in Java™, so it runs wherever Java® Version 6 runs: Windows® since Windows® 98, Linux, various Unix versions and on the Mac®. It requires 256MB RAM and about 40MB on your hard-disk during installation. Download a free demo version to try it out. Mind Map® is a registered trademark of the Buzan Organisation Ltd.